For generations, spicy foods have had a reputation for affecting pregnancy. The good news is that spicy foods are safe for pregnant women, and most of the claims about their effects on pregnancy have no basis in scientific research. However, some pregnant women may want to avoid spicy foods if they experience certain symptoms. Eating spicy foods during pregnancy is safe for the developing fetus. Physicians and medical authorities, such as the American Pregnancy Association, recommend pregnant women avoid eating raw or undercooked seafood, meat, poultry and eggs; hot dogs and deli meats that haven’t been heated to steaming; fish high in mercury such as swordfish, mackerel, shark and tilefish; unpasteurized dairy products and juices; alcohol; herbal teas; foods with excessive amounts of caffeine; and unwashed fruits and vegetables. These foods may cause birth defects or illnesses that can harm the baby. Spicy foods, however, are considered safe to eat while pregnant as long as they aren’t a spicy version of one of the foods classified as unsafe to consume during pregnancy. There is an old wives’ tale that claims spicy foods can stimulate labor, leading some women to fear that eating spicy foods could cause a miscarriage or preterm labor. There is no scientific evidence showing that spicy foods stimulate labor, nor has there been a link found between eating spicy foods and miscarriage or preterm labor. Spicy foods can aggravate morning sickness. 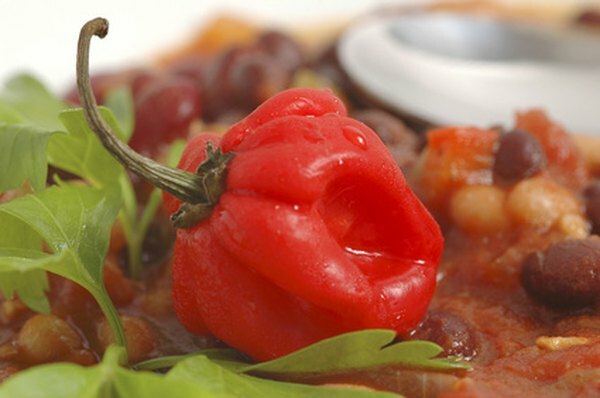 The mere smell of a spicy Mexican or Thai dish has turned the stomachs of many morning sickness sufferers. If you're experiencing a lot of morning sickness, you may want to avoid spicy foods. Spicy foods are known for causing heartburn and indigestion. Even if you're not someone who usually experiences these problems, these foods may affect you when pregnant. During pregnancy, the increase in certain hormones can cause the muscles in your digestive tract to relax, slowing down digestion and allowing stomach acids to creep back up into the esophagus. These changes can cause heartburn and indigestion. If you find that you're prone to these problems during your pregnancy, pass on spicy foods to avoid discomfort.